I Contain Multitudes is a wonderful, beautifully written book that transforms what could be a dull, tedious scientific read into a masterful, delightful adventure introducing microbes’ role in health, evolution, ecology, and culture. Utterly fascinating, clever and filled with engaging stories, this book is a winner. And Ed Yong is an exceptionally talented storyteller. The stories are so real, so relevant, so wondrous, I found myself reacting physically as I was reading with a smile, a cringe, a gasp. A fascinating role of our microbiome is the potential influence on our mental health. Although studies are limited and in their infancy, there are early indications that our microbiome may play an important role in helping people manage mild stress and depression. Yong goes one step further to posit that if microbiomes can shape our mood, perhaps they can also shape our choices and, thus our destiny. There’s so much to glean from this captivating adventure into our microbiome. You’ll gain insight into the good, the bad, and the truly ugly—and enjoy every moment of the journey! 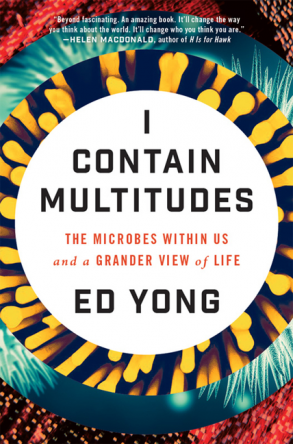 For a sneak peak, watch Yong’s speech, “The Microbes within Us” given the day I Contain Multitudes was released.